How to set a valid area to pop up images slideshows? Do you want people click some area on your flipping catalog and pop up a cool photo slideshow? It sounds good. It would show a group of pictures orderly. By clicking on certain part of the flash flip shopping catalog, you can get more images and much more supprise. 1 Start Flip ShoppingBook Maker, and import a PDF and edit it basically. 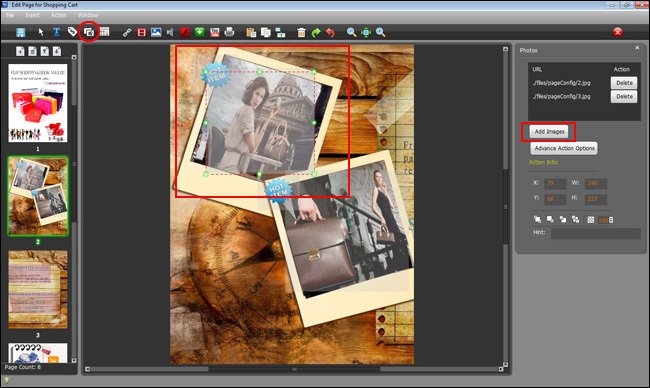 2 Click on the button of Pop up Photos, find an area to put a valid photo slideshow. 3 On the right edit window click on the button of Add Images. Note: it will show you photo slideshow when you click the valid area.